In a previous piece, I defined “training” as “teaching children concrete things or skills, giving them the opportunities to practice them, and helping them gain proficiency.” In the next one, I shared some of the stories we had read together aloud, discussions we had subsequently had as a family, and listed a couple of organizations that we felt were very valuable. I’d like to address a related topic this time- teaching children to think. For many years, I was a classroom teacher in both public and private schools. The experience was quite valuable to me in ways that I would not have guessed at that time. Mainstream schools are not training children in many useful skills. In most cases, the curriculum is set up for children to memorize facts long enough to regurgitate them on tests and then purge it. Little “building” goes on because facts are presented in isolation. It is rare that children are taught how to think and solve problems. To us, these things are very important and so they are among the reasons why we homeschool. How is This Related to Prepping? Though the above may seem like random observations that have nothing to do with prepping, we would argue otherwise. Shouldn’t a child who has completed 13 years of school be able to function competently as an adult? Isn’t that one of the major goals? But where along the way were they taught useful things like making a budget (outgo cannot exceed income), how to make an appetizing dinner from what’s in the pantry, and how to figure out which way is North? When they are presented with real-life problems and have never practiced finding creative solutions, why would we expect them to excel? Whether you choose to homeschool or not, training your children will largely fall to you. Not only are our schools not geared toward that, but there is no way that a teacher can effectively do that for 30 individuals of widely varying abilities. A lot of the teacher’s time is probably spent on crowd control and discipline. Having now put the onus on you to provide your child with the educational opportunities that will best prepare him for his adult life, I guess I should offer a little guidance on how you may go about that. We are by no means “parenting experts” or even “preparedness experts,” but I will share some of what we do. First off, we try not to give a child a solution that he or she is capable of finding on his/her own, especially if the process of getting there is beneficial. In the same way that doing your child’s math homework for him will not prepare him for the test, neither will solving his problems for him develop the ability to tackle future obstacles independently. For example, just today one of our children realized she had not saved enough money to purchase something she wanted (needed, according to her) to get today. She wanted me to give her the money today and she made a vague promise to work it off in the future. I declined that offer. If I rescue her from her self-made predicament, she will not learn to set aside money, deny herself the instant gratification of spending her cash immediately, or plan ahead. It will perpetuate the problem unless she has to work out a remedy on her own. The lessons learned from solving the problem are at least as important as the actual solution. As we read aloud or listen to an audio book, I often stop and solicit their opinions. The character has lost his last jug of water- what would you do in that situation? If everyone in Jamestown gets an equal share of the food no matter how hard he works, what do you think will happen? What new rules would you propose for the community instead? This is not one of those touchy-feely kinds of parenting things- I don’t mean that you have to justify your parenting decisions (much less get their approval first) to your children. What I’m talking about here is guiding their thinking. I can tell my daughter to mix together the flour, salt, baking powder, etc in one bowl and all the “wet things” in another, then add dry to wet, but that won’t be nearly as effective and explaining why I do that. Better yet if I first ask her why she thinks it matters. Unless she arrives at the conclusion that it’s hard to add the leavening last and have it mix evenly, it isn’t meaningful to her. And if she forgets the lesson, next time I could let her bake up the bread that only rises on one side. No real harm done and she will really have learned it. There are probably lots of things you can add to these ideas. Please do so in the comments section. Wow! Great post! Thank you so much for the time that you put into this blog. I especially love this article because this will ensure true survival of our nation. We can save up enough beans and Band-Aids for our physical survival, but teaching our children truly ensures the survival of our nation. Our children are our future, and if we don’t teach them the right way and have them retain it our nation will continue to decline. 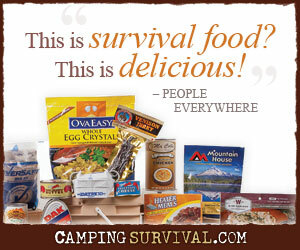 I hope all preppers will take this to heart. I’m going to have to share this with my family and friends. Blessings. I’m very active in the Boy Scouts and we have a couple of sayings that are consistent with the approach that Laura shared in this post. First: “Never do what boy could do.” It’s important to let them take some ownership. Let them do things that will help them grow and develop. If it’s not perfect, so what. They’re learning.